Skiing (technically snow skiing) is the activity of gliding over snow using skis (originally wooden planks, now usually made from fibreglass or related composites) strapped to the feet with ski bindings. Originally used primarily for transportation, snow skiing evolved into a popular recreational and competitive activity during the 20th century. The sport consists of many variations, each of which fits into one of the major categories of alpine skiing, Nordic skiing, or telemark skiing. Skiing is a pastime which has brought together all cultures of today. Many different types of skiing are popular, especially in colder climates, and many types of competitive skiing events are recognized by the International Olympic Committee (IOC), the International Ski Federation (FIS), and other sporting organizations. Skiing is most visible to the public during the Winter Olympic Games where it is a major sport. In skiing's traditional core regions in the snowy parts of Scandinavia, as well as in places such as Alaska, both recreational and competitive skiing is as likely to refer to the cross-country variants as to the internationally downhill variants. For most people worldwide, the term "skiing" refers to alpine skiing where one visits a ski resort, purchases a lift ticket, dons cold-weather clothing, skis, ski boots and ski poles, and embarks on a chairlift, gondola lift, or other means of mechanical uphill transport. Upon reaching the summit, the skier disembarks from the ski lift and travels downhill, propelled by gravity, usually along a marked route known as a piste, "run," "trail," or "slope". Most ski resorts use mechanical equipment to "groom," or pack down and smooth, the snow surface on certain ski trails. Grooming is normally associated with trails of lesser difficulty. Off- piste skiing includes skiing in unmarked or unpatrolled areas either within the ski resort's boundaries or in the backcountry, frequently amongst trees (" glade skiing"), usually in pursuit of fresh fallen snow, known as powder. Skiing or snowboarding outside a ski resort's boundaries, also known as out of bounds skiing, is illegal in some ski resorts, due to the danger of avalanches on the un-patrolled areas; or the cost of search-and-rescue for lost or overdue skiers. France and Canada are two of the few countries generally permitting this activity. In the United States, out of bounds skiing regulations vary by ski area; many ski resorts prohibit it and some simply post warning signs that skiers are leaving the patrolled ski area boundaries. However, lost or overdue backcountry travellers are usually held responsible for the cost of search-and-rescue service if uninsured. Backcountry skiers traveling in steep terrain prone to avalanches are encouraged to take avalanche training, travel with other experienced people, and carry special equipment for self-rescue. It is recommended that skiers make the local ski patrol aware of where they are going if they stray off-piste in case of avalanches or bad weather that could put skiers in danger. Skiing techniques are difficult to master, and accordingly there are ski schools that teach everything from the basics of turning and stopping safely to more advanced carving, racing, mogul or "bump" skiing and newer freestyle techniques. There are two primary types of downhill skiing -- "telemark" and "alpine." Telemark skiers use flexible ski boots, either leather or plastic, and do not have their heels locked to the skis. Alpine skiers use stiffer plastic, non-flexible boots and have their heels locked to the skis with releaseable bindings. The venue, speed and technical difficulty associated with the sport can lead to collisions, accidents, hypothermia and other injury or illness, occasionally including death. 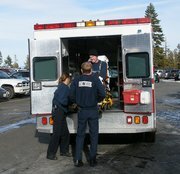 Regional Ski Patrol organizations, such as the National Ski Patrol in the U.S., exist as a voluntary organization to provide guidance, help, medical assistance and emergency rescue to those in need of it. For beginning skiers learning under a trained instructor, skiing speeds are low, the terrain is not steep and is often well-manicured, and the risks are relatively low. For extreme skiers, testing their expert abilities against ever more challenging terrain, the risks may be much higher. In addition to its role in recreation and sport, skiing is also used as a means of transport by the military, and many armies train troops for ski warfare. Ski troops played a key role in retaining Finnish independence from Russia during the Winter War, and from Germany during the Lapland War, although the use of ski troops was recorded by the Danish historian Saxo Grammaticus in the 13th century. The sport of Biathlon was developed from military skiing patrols. Another type of skiing called Jib skiing or New freestyle is a new style of skiing that started in the late 1990s. In this type of skiing, skiers use jumps also called kickers,or rails to do urban style aerial tricks. Downhill skiing for people with disabilities is both a recreational pastime and a competitive sport open to those with any manner of cognitive and/or physical disabilities. Adaptations include the use of outriggers, ski tip retention devices, sit-skis like monoskis and bi-skis, brightly colored guide bibs, ski guides, and inter-skier communication systems or audible clues for blind skiers. Recreational skiing programs for people with disabilities exist at mountains across the globe. In the northeastern United States, Maine Handicapped Skiing is one of the largest, operating at Sunday River ski resort, Other New England resorts with adaptive skiing programs include: Loon Mountain, Waterville Valley, and Mount Sunapee. In the western part of the United States, the National Sports Centre for the Disabled at Winter Park Resort near Denver, Colorado attracts both first-timers and world-class disabled athletes from Europe, Asia, and North America. Currently the International Paralympic Committee (IPC) and the International Ski Federation (FIS) sanction a number of regional, national, and international disabled skiing events, most notably a World Cup circuit, a Disabled Alpine Skiing World Championships, and the Paralympic Winter Games. Skiing for people with disabilities became popular after World War II with the return of injured veterans. In North America, a colour–shape rating system is used to indicate the difficulty of trails (otherwise known as slopes or pistes). There is no governing body that assigns difficulty ratings to ski trails. Instead, ski resorts assign ratings to their own trails, marking a given trail according to its relative difficulty when compared with other trails at that resort. As a result, identically-pitched trails at different resorts can have different ratings. Some skiers and snowboarders may interpret this as manipulation of ratings of their slopes to appeal to as wide an audience as possible; in fact, it is an attempt by ski areas to conform to the trail rating conventions. Although slope gradient is the primary consideration in assigning a trail rating, other factors come into play — including trail width, normal snow conditions and whether or not the resort regularly grooms the trail. Green Circle Easiest The easiest pistes at a mountain. Green Circle trails are generally wide and groomed, typically with slope gradients ranging from 6% to 25% (a 100% slope is a 45 degree angle). Blue Square Intermediate Intermediate difficulty slopes with grades commonly ranging from 25% to 40%. These slopes are usually groomed. Blue Square runs comprise the bulk of pistes at most ski areas, and are usually among the most heavily-trafficked. Black Diamond Difficult Amongst the most difficult at a given mountain. Black Diamond trails tend to be steep (typically 40% and up) and may or may not be groomed, though the introduction of winch-cats has made the grooming of steep slopes both possible and more frequent. Double Black Diamond Expert These trails are even more difficult than Black Diamond, due to exceptionally steep slopes and other hazards such as narrow trails, exposure to wind, and the presence of obstacles such as steep drop-offs or trees. They are intended only for the most experienced skiers. Variations Various Variations such as doubling a symbol to indicate increased difficulty, or combining two different symbols to indicate intermediate difficulty are occasionally used. One example is a diamond overlapping a square to indicate a trail rating between a Blue Square and a Black Diamond. The combination of symbols is comparatively rare at U.S. ski areas; most ski resorts stick to the standard 4-symbol progression. Terrain Parks Various Terrain parks are whole or portions of trails that can offer a variety of jumps, half-pipes, and other special "extreme" sporting obstacles beyond traditional moguls. The trails are typically represented by an orange rectangle with rounded corners. 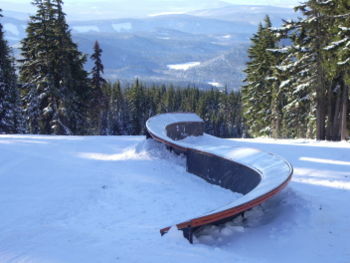 Usually, the terrain park will carry its own trail rating, indicating the level of challenge. A terrain park with a Black Diamond or Double Black Diamond rating would contain greater and more challenging obstacles than a park with a Blue Square rating. (Spain, France,Scandinavia) Learning or "Beginner" slopes. These are usually not marked trails, but tend to be large open, gently sloping areas at the base of the ski area. An easy trail, similar to the North American Green Circle, and are almost always groomed, or on so shallow a slope as not to need it. An intermediate slope. Steeper, or narrower than a blue slope, these are usually groomed, unless the narrowness of the trail prohibits it. An expert slope. Steep, may or may not be groomed, or may be groomed for moguls. "Black" can be a very wide classification, ranging from a slope marginally more difficult than a "Red" to very steep avalanche chutes like the infamous Couloirs of Courchevel. France tends to have a higher limit between red and black. (Austria, Switzerland, certain other areas) Extremely difficult. In recent years, many resorts reclassified some black slopes to yellow slopes. This signifies a skiroute, an ungroomed and unpatrolled slope which is actually off-piste skiing in a marked area. Famous examples are the Stockhorn area in Zermatt and the Tortin slopes in Verbier. In Austria, skiroutes are usually marked with orange squares instead. Beginner slopes. These are usually near the base of the mountain, although some follow switchback routes down from the top. Intermediate slopes. At most ski areas in Japan, these constitute the majority of the slopes (40° to 60°, depending on how the slopes are accounted). Expert slopes. These are the steepest and most difficult slopes at the ski area. The difficulty of these compared to like-classified slopes at other ski areas is heavily dependent on the target audience. Japan has more than 1000 ski areas (115 in Nagano Prefecture alone), many of them small and family-oriented, so comparisons between slope classifications in Japan and "equivalent" slopes in Europe or North America are minimal. This terrain park begins with three jumps, each with a variety of entries. Skiers and snowboarders can encounter a wide range of snow and weather conditions, in part due to the location of specific resorts and global weather patterns at the time. Natural snow ranges in consistency from very light and fluffy to dense and heavy, depending upon atmospheric conditions as it falls. Snow is often measured by moisture content, or the amount of water in a given volume of snow. Some areas of the United States' Rocky Mountains, for example, can receive considerable amounts of snow with moisture content as low as three to five percent; in the Northeastern United States and the Alps, moisture content is more typically 15 percent or more. Snow made by mechanical snowmaking often has moisture content of 35 percent or more. Temperatures play a critical role in snow moisture content, but other atmospheric conditions are also relevant. Air currents and other factors determine snow crystal shape; obviously, the farther apart given snow crystals are, the more air is contained in the newly settled snow, resulting in lower net moisture content in a given volume of snow. Snow produced mechanically typically has high relative moisture content and low amounts of loft because the crystal structure resembles small, dense pellets. Even the fluffiest snow has mass, and snow typically settles under its own weight after time. This is one reason why untouched snow measuring 20 cm on the day it falls might be measured at 15 cm the day following. Snow is also subject to sublimation — a process by which water can go directly from a frozen state to a gaseous state without first melting. It is this same process that ultimately makes ice cubes shrink in a freezer. There are other factors that impact snow beyond its moisture content and crystal shape, however. Snow is impacted by wind, sunlight, skier traffic, ambient air temperature, relative humidity and grooming equipment; all of these factors combine to change snow crystal shape and density over time. Powder: Light, fluffy snow, found during and immediately after snowfall. Skiing and snowboarding in deep powder snow is a favorite among skilled, experienced skiers and snowboarders; sometimes known as "powderhounds." Because Western snow generally has a lower moisture content, western powder is lighter and easier to ski than heavier eastern powder. Utah snow is especially known for being extremely light and dry. Packed Powder: Packed Powder is powder snow that has been compressed, either by means of mechanical snow grooming apparatus or skier traffic. The term can also be used to describe snow that has been properly made with adequate control over snow-making apparatus. This snow condition is favored by beginners and the majority of recreational skiers, in that it tends to be relatively forgiving, easy to turn upon, and requires less skill to negotiate than powder snow. Granular snow: Granular snow crystals are small pellets. Depending on sun and temperature conditions, it may be wet granular snow — meaning that there is a considerable amount of unfrozen water in it, or loose granular snow, which has no unfrozen water. Wet granular snow will form a snowball; loose granular snow will not. Wet granular conditions are often found in the springtime. Loose granular conditions are generally produced when wet granular snow has re-frozen and then been broken up by snowgrooming apparatus. Ice: skiers and snowboarders typically regard any snow condition that is very hard as "ice." In fact, true ice conditions are comparatively rare. Much of what is perceived to be ice is actually a frozen granular condition — wet granular snow that has refrozen to form a very dense surface. Telling the difference is comparatively easy; if one can get a ski pole to stand up in it, the surface is likely to be more of a frozen granular surface than an icy one — and while it's certainly not as enjoyable as many other snow conditions, skilled skiers and snowboarders can successfully negotiate it. In fact, it's a preferred condition among racers, in that the surface tends to be quite fast and race course conditions tend to remain more consistent during the race, with fewer ruts developing on the course. Another form of icy condition can be found at higher elevation resorts in the Rocky Mountains and in Europe; direct sunlight can melt the top layers of snow crystals and subsequent freezing and produce a very shiny, slick surface. Crust: Crusts are extremely challenging conditions. A crust condition exists when soft snow is covered by a harder upper layer upon the surface. This crust can be created by freezing rain (precipitation formed in warmer upper levels of the atmosphere, falling into a temperature inversion at which surface temperatures are below freezing, and freezing on contact with the ground), by direct sunlight, and by wind loading which packs down the upper layers of the snowpack but leaves lower layers more or less unaffected. Spring Conditions: a catch-all term ski areas use to describe conditions when numerous different surface types can be found on the mountain — usually in the later part of the season, although the term is sometimes used during an extended midwinter thaw. The term also generally reflects the presence of bare spots and/or areas of thin cover. With spring conditions, the snow is usually firm in early morning (even reaching frozen granular status if left ungroomed), breaking a softer corn or wet granular surface mid-day, and is often very soft and mushy in afternoon (many skiers refer to this type of snow condition as "mashed potatoes," due to its heaviness). In some instances when the snow is untracked, sun baked, slightly dirty, with the consistency of a snow cone, it is called "tecate powder." The speed with which conditions change on a given spring day is directly related to the exposure of the slope relative to the sun. East- and south-facing slopes tend to soften first; west-facing slopes generally soften by mid-day. North-facing slopes may hold on to their overnight snow conditions throughout the day. "Skiing" is one of the few words in the English language that contains two "i"s in a row. Here are some valuable tips to consider before going out skiing. First, skiiers should be fit for this activity, as injury could occur easily. Just like other sports, good skiiers warm up before starting. This also reduces the probability that injury will occur. Assistance is available. If a skiier feels that they are not experienced or capable enough to safely ski, there are almost always experts and instructors available for assistance and instruction. Skiing can be a dangerous activity, so knowledge of skiing's fundamentals is imperative. Knowing one's limitations is the first step in NOT getting injured. Safe skiing equipment is a must. All equipment should be in good condition and properly fitted. Gloves or mittens to keep hands warm. Goggles or sunglasses to protect eyes from harm. Fleece top or sweater; the mid-layer or insulating garment. Ski poles, measured for proper fit. Thermal underwear and ski socks. Helmets may reduce the risk of head injuries. Research into helmet usage is ongoing; some studies suggest that helmets are of minimal value in high-speed accidents, and that some skiers may take additional risks while wearing them. Boots which are sized properly when worn over one pair of warm socks. Water-resistant and windproof pants or salopettes. Skis that are the right length for one's height and ability, mounted with ski bindings properly adjusted for one's height/weight and ability. Skiing and snowboarding video and movies as a genre, emerged with such classics as Otto Lang (film producer) Ski Flight, Warren Miller, Dirk Collins, and XCZONE.TV leading Nordic Skiing Producers.